See, hear and touch a world of amazing things as your senses literally discover a new world of experiences. From swimming with dolphins, snorkelling through colourful clouds of tropical fish and safely eyeballing sharks and barracuda, Discovery Cove packages offer a brush with the natural world that's never to be forgotten. The dolphin swim is the centrepiece of your visit; here you’ll spend 30 minutes, in groups of no more than 10, getting to know your dolphin through hugs, kisses and ultimately, a one-on-one swim together through the lagoon. Then, you have the rest of the day at your leisure to soak up the unique, indulgent atmosphere. The Grand Reef is a marine experience like no other. Immerse yourself in waters teeming with sea life… where thousands of exotic fish and rays await you. Everyone is invited to wade, swim or snorkel freely through this vibrant reef. You never know what you’ll discover. Safely share the water with exotic eels, lionfish and sharks. Explore water-side trails and bridges to one of the reef’s many islands. Wade with friendly stingrays and then discover the Explorer's Aviary, just beyond the towering waterfalls, where you can hand-feed tropical birds. Relax in the refreshing waters of the Resort Pool and float along the Wind-away River. Freshwater Oasis features swimming and wading adventures and face-to-face encounters with playful otters and curious marmosets. Designed with a rainforest canopy above and sparkling clear springs below, Freshwater Oasis is a natural fit within Discovery Cove’s tropical vibe. 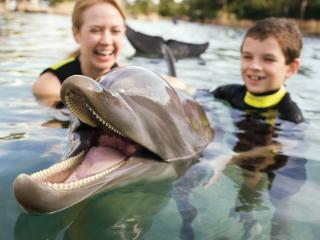 Discovery Cove attendance is limited to 1300 guests a day, so all bookings require a reservation. Book well in advance to avoid disappointment! 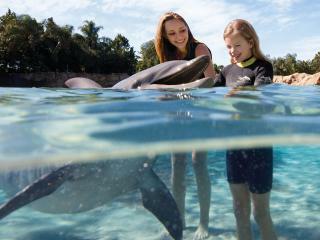 When processing your booking, please ensure you detail the exact date of your planned visit to Discovery Cove. There is a choice of two Discovery Cove Packages. You must be at least 6 years old to swim with dolphins. Children between 6-12 years old participating in the dolphin swim experience must be accompanied by an adult who also is participating in the dolphin swim experience. The Non-Dolphin Swim option includes everything detailed with the exception of the dolphin swim. 14 consecutive day’s unlimited admission to SeaWorld® Orlando and Aquatica®. Unlimited access throughout the day to the Serenity Bay, Wind-away River, Explorers Aviary and The Grand Reef. Children must be aged 6 or over to take part in the Dolphin swim. Children between 6-12 years old participating in the dolphin swim experience must be accompanied by an adult who also is also participating in the dolphin swim experience. There is no minimum adult to child ration, so one adult can accompany more than one child. In order to ensure everyone's safety, participants must be able to comprehend safety-instructions in English. Any minor under the age of 18 years participating in the dolphin swim experience must have a “Minor” waiver completed by a parent or legal guardian. If a parent is not present at check in, they will need to complete a liability release form prior to the day at Discovery Cove and those accompanying the child will need to bring the completed form as well as a photo copy of the parent’s Driving License or Passport to verify their signature. Please contact us should you need a form sent with your Discovery Cove documents. Please note you will be issued with a Discovery Cove booking confirmation which you have to present upon arrival at Discovery Cove. Discovery Cove no-longer issue hard tickets.